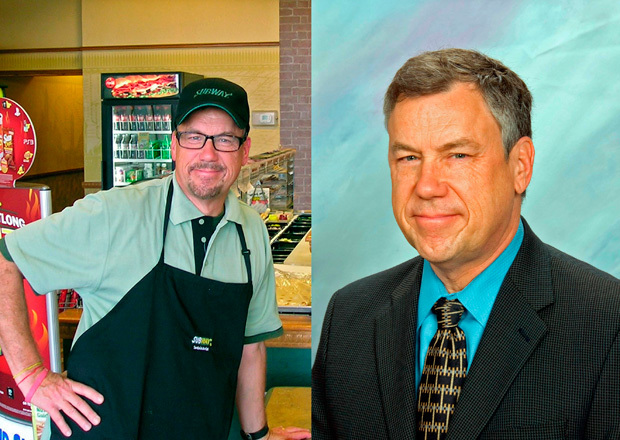 On Sunday's Undercover Boss, Subway's chief deployment officer Don Fertman found out what it's really like to have a line of hungry customers staring at you while you make sandwiches. While Fertman didn't become a sandwich artist overnight, he did learn some valuable lessons. Fertman talks about his experience with BNET's Melanie Warner. BNET: Everyone knows how to make a sandwich. Did you think your experience behind the counter was going to be easier than it was? Fertman: Our sandwich artists make it look a lot easier than it is, so yes it was harder than I thought it was going to be. It's harder to cut a piece of bread than you think. It's harder to peel apart two pieces of cheese than you think. It's harder to peel apart a couple pieces of ham from a stack. When you have a whole line of people standing there looking at you, waiting for their sandwich, the pressure is on. BNET: Sounds like you're still perfecting the art of sandwich making. Fertman: I'm trying to be a sandwich artist, but I'm probably more of sandwich sketcher. BNET: You've been at the company for 27 years, did you learn anything about Subway that you didn't already know? Fertman: One of the reason Fred DeLuca, our founder and CEO, chose me to be the undercover guy is because I'm the development guy instead of the operations guy, so I'd have a fresh perspective on things. At Subway, we say 'eat fresh,' this was an opportunity to think fresh. So I got to see how the decisions we make at world headquarters affect the people on the front lines -- how sandwich artists have to deal with the fact that we've added flat bread to the line in addition to the various breads we already have. We've added spices and cheese to our breads. We've added toasting. Every time we add something it's that much more think about and integrate into the operation. If we throw too much at folks all at once it can create a bottleneck. So it showed me that we really need to think our decision-making process through to the front lines. BNET: What management lessons, if any, are you taking away from this? Fertman: Top management needs to spend time in stores. That was one of the first things I brought back and discussed with Fred DeLuca and with our management committee. We even discussed it at our system advisory council meetings, where we review our strategic planning for the future. An important part of our business is the in-store experience, and we all need the perspective I got during my time undercover. There are a lot of folks in the field who have a lot of great ideas on how to make things better, whether an idea for a sandwich or a slight change in a procedure, a way that we could do catering, or a way we could do delivery. It made us realize that we need to spend more time fostering innovation from the field. BNET: How will you go about making that happen? Fertman: Fred DeLuca is a hands-on CEO and he has regular conference calls with the people that are out visiting and evaluating our stores. He has calls each month with developers out in the field and he has regular calls with our franchisees. My suggestion to him was to bring that a step further and do the same kind of round tables with our in-store managers and sandwich artists. So we're adding that to our innovation plan. BNET: So will corporate executives really be making Footlongs? Fertman: Yes, it's important to get behind the counter. You don't know what it's really like until you're there, sweating with a line out the door. We're discussing doing it on an annual basis and having it implemented by the spring. At our recent system advisory meeting, our challenge for all of our top management was to come to our next meeting in April prepared to tell us all about your in-store experience. So everybody gets to go undercover. BNET: Rightly or wrongly, many health-conscious consumers say they want to avoid high-fructose corn syrup. And because Subway has succeeded in positioning the chain as a seller of nutritious, fresh food, many of those consumers might not know that Subway's 9-grain bread has more high-fructose corn syrup than whole wheat flour. Fertman: That's an ongoing process for us. It's something we're working on as we speak. You've got to look at the overall opportunity to eat better. Compared to the other chains, there's a healthier aspect to our sandwiches. People say, 'I want something that's going to clog my arteries, I'm going to go to McDonald's. Health be damned.' It's about choice for the consumer. As long as they're armed with the facts and the list of ingredients, people can make the appropriate choices. BNET: Most people don't realize that Subway has way more restaurants in the U.S. than McDonald's and that you recently overtook them globally. Fred DeLuca says he sees the capacity for another 5,000–7,000 U.S. outlets. How do you do that without cannibalization? Fertman: When it comes to adding stores our biggest area of focus is non-traditional development, like the church location or the store I spent time in in the Orlando Science Center. We can put Subway stores, because of the simplicity of the operation, just about anywhere. Look at the World Trade Center store. It's in something the size of a trailer and it's being literally lifted up floor by floor as they build the new World Trade Center. That shows what we can accomplish.